Beyond Surface and Material is a group exhibition that presents the work of emerging and internationally-renowned visual artists whose distinctive practice has reinvigorated and provided new insights into the long-standing relationship between photography and textiles. Work as diverse as Jess Edwards' concerns with the importance of the makers hand and their engagement with craft, and Patrick Snelling's customised and augmented installations provide a glimpse into the richness and distinctive material concerns in the new tactile languages presented in this group show. 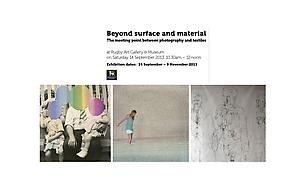 For more information please visit Rugby Art Gallery and Museum's website.